It's just nice to hear this from Nina after all this time. I just feel like there was no compromising with Joel Silver and she got most of the heat for it. Well, I still remember her being particularly nasty about the cancellation--almost as if she were enjoying sticking it to the fans. So, I'm a little skeptical about her words now. Silver sunk the ship and the WB wouldn't even throw it a life preserver. I am down for a Moonlight reboot but I cannot accept a new Mick. I just can't. Alex truly brought a lot of the character to life. 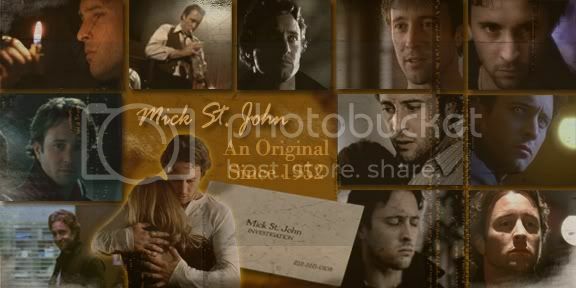 It would be cruel to expect a new actor to fill in his shoes as Mick St. John. Mick knew he was on to him (especially because of that list) so he left and then Beth followed so Talbot is retracing Mick's steps from the earliest he can trace him and so on. allegrita wrote: Personally, I wouldn't mind seeing a Moonlight reboot in a five or ten years, with a whole new cast. If they did it now, I'd prefer a spin-off show about vampires in that same universe, but not "our" characters. Sort of like Star Trek: The Next Generation. A new bunch of stories in the universe we loved, but no attempt to "reboot" the core characters, because that would feel wrong to me. I wonder if the network would be open to that. Spinoff = same or different premise, different main characters, same fictional world in that characters in the original and spinoff can crossover, e.g. Angel, all the Treks, CSIs, NCISs, etc. I think the problem with a Moonlight spinoff featuring Josef, Guillermo, Logan as main characters is that it would require too much of a change to the core premise of the show. I'm having a hard time thinking of a successful spinoff that changed the premise of the original. The only ones that come to mind are sitcoms: Happy Days/Mork & Mindy, Cheers/Frasier. In the realm of dramas, Deep Space Nine (space station setting) was the least popular Trek show and they actually added a spaceship in the 3rd season so the characters could boldly go exploring like on the other Trek shows. In contrast, Crusade (spaceship setting) was a failed spinoff of Babylon 5 (space station setting), which indicates that it's not necessarily a faulty premise that makes some spinoffs unpopular, but rather that viewers expect spinoffs to have the same feel as the original. Buffy was about a teenage Slayer and friends saving Sunnydale (or the world) from big bads each season. 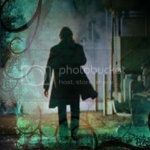 Angel was about a noirish vampire PI seeking redemption by helping the helpless. That lasted all of one season. From the second season, Angel got more friends, dropped the noir, de-emphasized the procedural elements, and focused on saving Los Angeles (or the world) from big bads each season. Basically Angel's storytelling became more Buffy-like. To me, the core premise of Moonlight is noirish vampire PI helping the helpless and looking for love. Mick is a hero character in a profession that allows him to save people and this is what drives Moonlight's style of storytelling. Josef, Guillermo, Logan, etc. are not hero characters (at least, I can't see them taking an interest in and risking their lives for total strangers). So a show centered around them would be like...? I imagine something along the lines of Sonata and what was planned for Moonlight season 2 -- a non-procedural drama about internal vampire politics and power struggles with perhaps a dollop of romance. Something similar to Kindred: The Embraced or The Originals. While I enjoy(ed) both of those shows, and could also enjoy a Moonlight version, it wouldn't really be Moonlight to me. Last edited by myimmortal on Sat Jan 24, 2015 7:30 am, edited 2 times in total. librarian_7 wrote: Well, I still remember her being particularly nasty about the cancellation--almost as if she were enjoying sticking it to the fans. So, I'm a little skeptical about her words now. Hm, I don't remember anything nasty from Nina. In retrospect, there was a lot of cray-cray in the Moonlight fandom at that time. If she was trying to save the show but getting flack from fans, I can understand why she may have lashed out. I'm less skeptical of her words now because I can't fathom why she would mention Moonlight out of the blue like that if she didn't mean it... unless she's pure evil and gets a kick out of taunting fans? LittleTwoLegs wrote: I am down for a Moonlight reboot but I cannot accept a new Mick. I just can't. Alex truly brought a lot of the character to life. It would be cruel to expect a new actor to fill in his shoes as Mick St. John. I understand that feeling. I have friends who refuse to watch the rebooted Trek films or the new Battlestar Galactica because they just can't accept anyone in those roles but the actors who originated them. I don't mind recastings because there are already rebooted shows that I like, so I'm open to seeing the different takes that actors could bring to favorite characters. Also, over the years, I've had a few beloved shows get canceled too soon -- or in the case of Forever Knight, have a series finale so awful that I want it erased from canon. I would love to see those shows get another chance to reach their potential. I don't know anyone who thinks Talbot is a compelling character (maybe you're the first? ) so I can't imagine him being at the center of his own show. myimmortal wrote: . Also, over the years, I've had a few beloved shows get canceled too soon -- or in the case of Forever Knight, have a series finale so awful that I want it erased from canon. I would love to see those shows get another chance to reach their potential. I was so traumatized by the series finale of Forever Knight, I wouldn't even consider watching earlier episodes for years. Now, I just like to pretend Season 3 never happened. I think Talbot was amusing; not exactly a character I liked but I didn't dislike him. If he was given more of a chance to develop I think he couldn't be a good character; he's persistent, he all ready suspects something is up with Mick, he doesn't have a romantic tie to Beth. I'd like to see him go after Mick, thinking he [Mick] killed Beth and fled or something. Maybe from the opposite end there is Josef, trying to impede Talbot's investigation but he can't have him killed (too public) ect. Idk, I'd like it. In reality I think I just need more Moonlight.